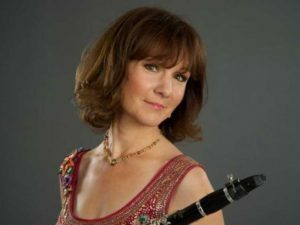 Emma Johnson – acclaimed as “Britain’s favourite clarinettist”* – will be the celebrity soloist with St Albans Symphony Orchestra for their end-of-season summer concert on Saturday 24 June (7.30pm St Saviour’s Church, Sandpit Lane, St Albans AL1 4DF). Emma, who gained international success after winning the BBC’s Young Musician of the Year competition in the 1980s, will play Lost Lanes, Shadow Groves, an intensely lyrical concerto by composer James Francis Brown, also co- director of this month’s Hertfordshire Music Festival. Since giving the first London performance last year she has become a champion for the work, which is inspired by childhood memories of rural Norfolk. “I really love the piece. It is rare to come across so beautiful a new piece of music that really inspires you. So I was really pleased to be asked to perform it again in St Albans,” she said. The concert will open with some of the English Dances written by Malcolm Arnold in the 1950s, characterised by a mixture of rumbustiousness and charm.